Dassia (sometimes spelt Dasia) is a large resort, spread both sides of a busy main road. From this main road though, there are several smaller roads leading down to the Dassia beach. Close to the beach there are large hotels. Some are quite spectacular. Apartments tend to be the other side of the main road - about 500m from the beach. If you are looking for a 'hotel' holiday, then Dassia should be on your list. Dassia Beach at the Chandris Hotel. There is the main Dassia beach which seems to stretch out for miles. Also two small cove type beaches at the edge of the resort. Shingle until about 1 meter into the water changing to sand. To the edge of the beach at Dassia, you will find shaded areas that are perfect for spending all day. There are no Showers on the beach of Dassia. Toilets in the numerous bars on the Dassia Beach. As the beach is far from the main busy road it is suitable for children - in as much as you do not need to worry about cars. Parking is nearby, but some walking will be required. There is a network of excellent footpaths to the beach and along the top. The beach is clean, but as with many of the beaches on the North East coast, it does suffer from some seaweed on the beach - not unpleasant though in any way. At the South end of the resort you will find a smaller beach - with a ruined Venetian boatyard. The lively resort of Ipsos is just a ten min walk. (Dassia is not without some excellent bars and smaller clubs though). 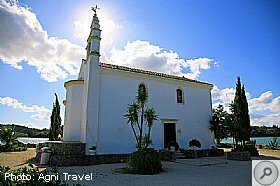 The exclusive resort of Kommeno is just round the headland towards Gouvia and the famous 'Church Island' is worth a visit. From the main Paleokastritsa road look for the turning to 'Kassiopi'. 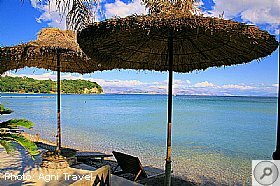 The Kassiopi road takes you to all of the resorts and bays along the NE coast of Corfu. Follow this road and just before Ipsos - the main road goes straight through the resort - you cannot miss it. 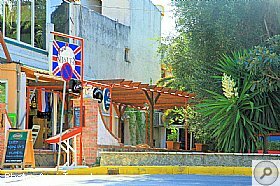 Dassia has many good tavernas and restaurant which serve local and international cuisine. There is also a Chinese and a Indian restaurant in Dassia. Whatever you might prefer you will find it in Dassia. Lots. Several 'beach bars', and more up on the main road. For an English experience, do not miss out on a trip to 'Shakes Bar'!!! Shakes Bar also offers a delicious Indian Menu and a range of non Indian family favourites for those preferring more traditional pub food. They also have a children's menu and vegetarian dishes. Dassia is a water sports resort and there is a large purpose built jetty that caters for this. Water skiing, Ringo, banana rides and parasailing is available at the jetty. Corfu Boats Hire - Dassia is located in front of Dassia Chandris hotel in the bay of Dassia. 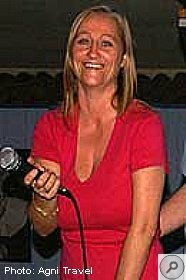 Mary and Nicos, the owners, are always there to assist you with more details about places that you can visit with your boat. In Dassia are numerous shops of any kind. Whether you are looking for the souvenirs or daily needed items, you will find it there. The majority of shops is placed on the main road of Dassia. hypermarket, and is useful if you are planning to stock up.You will find it on the main Paleokastritsa road, just opposite the Gouvia junction. Mostly hotel type close to the beach. There are some apartments at the edges of the resort. There is also a campsite. Dassia has several cash machine located in the line of shops and also there are many places to change travellers cheques and foreign currency throughout the resort. Unfortunately there are no public swimming pools in Dassia. In Dassia you can only find those belonging to the hotels. At various points throughout Dassia there are public telephones that require a card, these can be purchased at the shops and supermarkets near by. Also there are Post boxes near these. Most of the smaller bars are geared for families and cater for children. There is also a mountain bike rental shop for older children. Ideal, as the whole resort is quite level, with few steps. Most of the roads to the beach are paved - including the beach front. There is a 24 hour clinic along the main strip of Dassia. This page focused on: Dassia Corfu. For related information, please visit our Corfu Resorts Guide page. On the other hand, for what you want to do, the Green Buses are ideal. You're not far from Corfu town and they run back fairly late. If you get stranded, a taxi back will hardly break the bank. And nearby Dassia is actually on the end of the local town-area blue bus routes, which run even later. Take the first bus into town in the morning and then the next one to Paleokastritsa. Remember to grab a copy of the timetable at the depot to check your journey back. It's about a 45 minute run between Paleo and the town, and maybe half an hour between Ipsos and the bus station. And that's if you can't find a tour operator that simply runs a day coach to Paleo. Tom & Marion are you about?? Jules has said Janet & Sue are in Paleo for a week from the 8th, hope we get a chance to all meet up somehow. I have just returned from a week in Paxos and a week in Dassia Corfu and I can confirm we had no problems at all with anything. The people were there lovely kind and welcoming selves that will never change. We had a fantastic time in both places and wish I was there right now, first day back a work is never good!!! Just go and enjoy your holiday nothing to be concerned about. I think Katerinas floor space is larger, but I've found Aphrodites better stocked, that's going by my experience when I visit mid May/early June and October. There is another smaller corner shop further on from Aphrodite just before you get to the Sunshine Hotel entrance, and one across the road from the Shell petrol station. It's not just Agni that Aphrodite delivers for, some other travel companies use her as well. Katerina sells UK papers, Aphrodite doesn't. All corner shops will be more expensive than the larger supermarkets. Your nearest supermarket from where you'll be staying is AB supermarket in Ipsos. As you drop down into Ipsos coming from Nissaki, its about few hundred yards on your right, couple of flags one of them Greek hang over the entrance. This supermarket has 2 floors, there is a lift to take your shopping trolley upstairs. Further down the coast at Dassia you will find a couple more supermarkets..
Ah - the embarrassment! never mind, we have all done it though. My best though, was reversing into a drainage culvert behind one of the hotels in Dassia. We were in Corfu many years ago in our own car, which came as standard with a large tea tray type spoiler on the back, which meant that as I was turning round, there was restricted vision. This meant that what looked like a chain link fence with solid ground up to it concealed this concrete culvert about 3 feet deep. Inevitably I could hold the car there and eventually the rear wheels sank over the edge and the car settled onto its floor pan - and being rear wheel drive, there was no way I could drive out! Then, enter stage left a whole host of locals who set to with logs, planks and car jacks (including ours) and preceded to lift the car out of the culvert. And then just as quickly (and before I could offer to buy a drink or whatever) they all melted away again. My personal favourite drive around that we did was starting in San Stefanos for breakfast, Arillas, Afionas, Ag Georgios and finish up in Paleokastritsa for lunch. Have a walk up to the Monastery and visit the aquarium. Old Perithia is lovely too and good for a quiet bite to eat. The beach is Dassia is lovely. 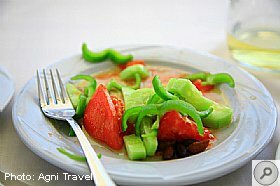 Lunch in Agni Bay is another favourite but the drive down to the beach is pretty steep, well worth it though! View Topic: Where To Go? Janmanessi you are not wrong! One map I looked at had the Dassia Chandris in the middle of Ipsos seafront - wouldn't like to walk that one with a stone in my shoe! One question I would like to ask of members who have used the shuttle bus with Lord Travel is, do they drop you off at your accommodation or at a certain point in your designated area i.e. Dassia? Daveneil, the route you mention doesn't need sat nav. Here is my proven over many years route. Follow windy narrow road to next T junction. (Sea in front of you) Turn left, be carful a bit intimidating. Follow this road all the way, you will pass the Old Fort on the right, and at the same time the cricket Pitch (car park) on your left. Road bears left, look for road on right between columns. Sea now on right, one way system, follow road, past port on right, keep going. T Junction with right filter, turn right, dual carriageway. After a couple of Klms or so, major signs for Paliokastritsa straight on, Dassia Kassiopi turn right. Keep straight on towards Paliokastritsa. After a while you come to another junction, Pallio straight on. Right turn for Sidari, Acharavi, turn right, over the trumpets Pass. Simple from here, just follow signs for Sidari. Topic: How To Get To Corfu Town? I am sure you will have to change in Dassia. There have been previous posts regarding this so suggest you do a search. Otherwise call in at one of the tourist shops in Kalami and they will have all the info you need. View Topic: How To Get To Corfu Town? The easiest way is boat Ollie but trips tend to be for half day giving you about 4 hours in Corfu Town. You could contact http://www.dailycruisescorfu.com/ as I believe there are days when they do a morning and an evening trip so maybe you could go out in the morning and back with the evening trip. You can catch also a bus from the main road above Kalami but I am not sure how late this runs and you may have to change in Dassia. I promise to try to make this quick! First timers, please feel free to question me further on anything you'd like more info on. Flight perfect. Long wait for cases. Transfer OK, bit longer than expected due to other drop offs. Different rooms to last time. Spent first night pretty much at the Belvedere pool bar, quick side trip to Petrino's and back for dinner in The Belvedere restaurant. Food & service were really good. Tuesday was a dull rainy day on & off, so we mooched around shops, went to the Aquarium which was small but worth the 6 euro, you could pet a rock python if you wanted to. You can pay an extra 6 euro to have a trip on a glass bottomed boat. Ate at Nausika (I think???.. It was Greek night). You have to try Grandmama's lamb here. Wednesday started nice & clear, went to the beach for a few hours until it went dull then back for a siesta. Went to La Grotta for La expensive beer and Spiros for dinner, although its popular for the BBQ I had mousakka which was lovely, had prawn saganaki starter, wasn't quite what I'd expected but everyones recipe is different in Corfu. Thursday spent the day on the beach at The Poseidon, great on the beach service and surprisingly good prices. Really liked this place. In the evening we took the organised trip to Corfu town, got me a lovely 'Prada' bag and discovered Rosie's bakery - well I presume that's what it's called, fantastic lady described all the baklava, and even told us the best way to eat it. Back to Paleo and Petrino's to watch the match and had a light supper plus home made cheesecake, lush! Big old thunderstorm that night. Friday sea amazingly much calmer after the storm, hired a scooter from Spiros, got a good deal, rode over to Dassia, Ipsos, Nisakki etc, stopped at Kassiopi for icecream then on to Roda to visit a friend working at The Boathouse bar for summer. Dinner at Limani by the harbour, good food again. Saturday more scooter adventures, rode up to Arillas, spent some time on the beach and had lunch at The Mirage hotel, lovely looking place and great location! Stopped at Georges on the way back through Lakones for raki & wine. Dinner was Nikos' BBQ at the Belvedere pool bar, was OK but feel like I missed out on a lovely taverna meal, he did top it off with a ridiculous half a watermelon/ouzo cocktail. Other half was worse the wear after that and a couple of cocktails at Me Gusta. Sunday. Couldn't get a sunbed at Posiedon so went over to Akron for a few hours, take away gyros from O'Merkalis for lunch. Dinner at Nausika again as it's so good! Beds were hard as rock, I didn't actually sleep properly all week, then due to the echoing noise issues I couldn't get an afternoon nap either. Errr sorry, that wasn't short was it??? View Topic: Dassia Or Barbati? Depends when you are going and what you like, are they young teenagers or older? Ipsos has Planet Ipsos which is a sort of amusement arcade with games machines etc., for kids of all ages. I have always found it to suit me but have only visited in May and September so not sure I would like it in the busy high season! As it is situated on the coast road between Dassia and Barbati it may suit you, particularly if you have a car and can get out and about, Corfu town nearby and pretty central for exploring the north of the island. There is some nice accomodation in the area up the hill towards Kato or along the coast road going out towards Barbati. Have a browse on some of the accommodation sites such as Travel Republic and Hotels Combined where you can check out peoples reviews. Just a word of warning, some of the maps showing accommodation locations are a bit iffy when I was looking for availability it showed two accommodations side by side on the map that I know are about 2 miles apart!! Need to decide whether it is best to stay n Barbati or KΓ‘to KorakiΓ‘na (Dassia). We are a family of 6 (with 4 teenagers) and will have a car. Any suggestions please? I cannot find any reviews for it. Must have been done a few years ago, but have enjoyed making my way through Dassia, bringing back such happy memories. [QUOTE=Carron]Wow - thank you all so much for giving me such detailed information and advice. I will take Dassia off my list and check out the new resorts mentioned. It does feel like Kassiopi would be good for our first visit and ideal for getting to see other parts of the island from. I was going to go for Dassia originally as the transfer times to the North look horrendous. I'm guessing that where it says 1.5 hours that's on a good run? Hi Carron it only takes 1.5 hours because it drops people off along the way at other resorts. It is only about half that by car, or it is the way my husband drives!! Look on the bright side, if it is in daylight you get to have a quick deco at the other resorts along the way!! Wow - thank you all so much for giving me such detailed information and advice. I will take Dassia off my list and check out the new resorts mentioned. It does feel like Kassiopi would be good for our first visit and ideal for getting to see other parts of the island from. I was going to go for Dassia originally as the transfer times to the North look horrendous. I'm guessing that where it says 1.5 hours that's on a good run? 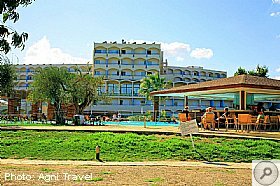 We stayed in Dassia a few years ago and for us felt it was too touristy without the beauty and scenery that you get in other Corfu resorts. I agree with the others that Kassiopi sounds like it would tick your boxes and is somewhere we like to visit in the evening and sit at one of the harbourside bars and watch the world go by. For us, Kalami is our favourite with a handful of restaurants and 3 more to visit in Agni bay by boat taxi, however, there are only two bars... Cocktails and Dreams is where everyone spends their evenings after dinner and has entertainment. 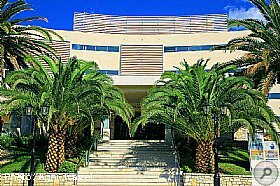 Of the 4 resorts you mention, Dassia is the closest to the airport and to Corfu Town so your transfer would be shorter and you can pop into town easily. My experience of it is limited to passing through it on the way to or from the airport/the capital. I've never stayed in either Acharavi or Roda. I've visited Acharavi a couple of times and Roda several times. Acharavi is a working town as well as a resort and has some all year round facilities. We stayed in Kassiopi last year after 11 holidays in Kalami (which is beautiful but probably would not have enough bars & tavernas to fit your requirements). We are staying in Kassiopi again this year and Kassiopi would be my suggestion for you. The route from the airport to Kassiopi follows the coast for much of the way and the views are splendid. The quickest route to Acharavi and Roda is over the Troumpeta pass and offers some extensive and lovely inland views. There's a direct bus service from Kassiopi to Corfu Town (doesn't run in the evening). There is also a bus service from Kassiopi to Sidari which (presumably) stops in Acharavi & Roda en route so you could visit them too. Kassiopi is the centre for most of the boat trips from the north of the island. Among other boat excursions there are both day and evening trips to Corfu town. The route for these is the Corfu channel and the views of Corful and Albania are delightful. 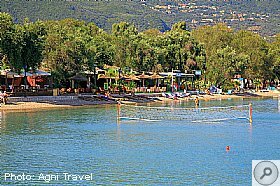 From Kassiopi you could also visit the charming, smaller resorts on the north east coast. You could visit them from Acharavi or Roda too, you'd just be starting from further away. There are probably charming, smaller resorts near to Acharavi and Roda that I am unaware of. Despite 12 holidays on the island we still have places to explore. If you're thinking of hiring car then Kassiopi, Acharavi and Roda all offer easy access to the main road around the north of the island. Said road skirts along the edges of Kassiopi and Roda and runs through Acharavi. There are several roads off leading to Acharavi Beach and much of the accommodation and refreshment outlets are down these side roads. What do you want from a beach? All the north east coast beaches, including Kassiopi, are shingle. Acaharavi and Roda have sandy beaches. 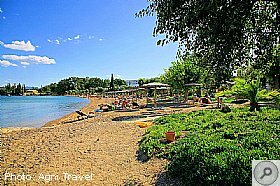 Kalamaki would be the nearest sandy beach to Kassiopi - a 10 min drive or 30 mins or so walk away. 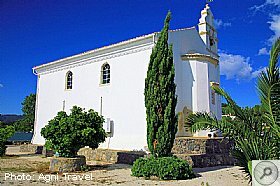 Sorry probably not going to help much but having stayed in Roda for the last 25 years I think it has everything you are looking for and more. Unfortunately so do Acharavi and Kassiopi. Whichever of these three you choose you would have a great time. Choose one to stay in, visit the other two and stay in your favourite next time. Never stayed in Dassia. My hubby and myself are booking to visit Corfu for the first time in September - but I'm going mad reading resort descriptions and trying do decide which one to go for. I've seen Dassia described as both a lively resort and a quiet resort. We are late 40s so well past the 18-30 type holiday, but also want somewhere with a good selection of tavernas and bars as we like to try somewhere different each day. Could anyone offer me any help or suggestions please? I find the transfers good value for money, but you risk a ridiculous wait not being part of a major package/resort operation. Last time, from landing, it was over six hours before I got to Sidari. They made you wait hours on the coach for more flights to come in, then made so many stops for just two or three people at a time it became a farce for a full coach. There were as many people getting off at each stop just to use a hotel's toilet as there were actually disembarking to stay there. This time I'll taxi to the bus depot and ride the bus from there. I can't see it costing any more than a transfer. Even with a package tour, going to Paleokastritsa, I've had the hour-long diversion up to Dassia added on far too many times; once, even just to drop off some bags that had arrived on a later flight. I've seen contracts that specify a particular payment for an 'express' shuttle with no more than two stops. I'm pretty certain that means nothing when you're actually out there. It depends on your confidence driving on the wrong side of the road, getting from the airport to out of Town can be a bit daunting. Leave the airport road, turn right, at the end of that road the sea should be in front of you, turn left, follow this road keeping the sea on your right, the road bears round to the left round the cricket pitch, car park, turn right between two pillars, just keep going past the port etc, at T junction traffic lights filter right onto dual carriageway, your on your way. Take coast road to Dassia after you've passed Kondokali and Gouvia There are more detailed directions on the site somewhere.. 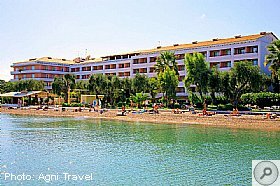 I am looking at booking for June this year to the Dassia beach hotel, does anyone have any knowledge or stayed at this hotel? I have thought a lot about Jan over the last year as I realised his health must have got worse as he had not been to Corfu for some time now. He always came on his own and camped in Dassia and always seemed gratefull for a bit of company. I last saw him in Norfolk at a meet-up a couple of years ago and although obviously unwell he didn't complain and had high hopes of recovering from his bypass operation so I really expected to see him this year. I will miss him. I am trying to get in contact with someone I met during the summers of 1986/87. His name was Christos and he worked in the Chandris Hotels in Dassia. Both his parents were also connected with the hotels. He worked along the beach selling drinks and ice creams. Would love to know what became of him and to get in contact with him again. If anyone knows any information on him I would love to hear from you. Not sure what happened to the late arrivals, but Mum travelled this week. Arrived in time for a last boat across but the bad weather stopped a transfer on Monday. Olympic managed the blip fairly well this time. they were taken to a nice place in Roda thankfully not that horrid place in Dassia or Kavos (sorry but if you book Paxos why put you up in a place that is the complete opposite). They enjoyed the trip up the coast and thought positive thoughts like well we are having a 2 centre trip. They knew they would be on an early boat so wanted an early night after being up very early for the flight. However the rep arranged to meet them all at 10.30pm!! A fellow guest had been getting rather fresh at the bar since arrival, and obviously didn't listen as they were not waiting for the coach at 4.40am!! They were located and woken up. Apparently a bit of a rush to get them to the coach as on arrival at the port they discovered they had left their false teeth in the bathroom at Roda! All got the boat and were at Bastas not much after 8.00am. Teeth still in Roda. This same person must have then got giddy at the pool bar in the afternoon, fell down the steps on their way back to the room. Last heard under instruction from the doctor to lay down and keep still. People often ask us what we do for entertainment on 'boring' Paxos. Have posted the same on T.A. Got back from Paleo on Friday. Stayed at The Belvedere for a week. Against our better judgement we booked with Olympic having had problems in the past but we chose an afternoon flight with Thomson's (paid a wee bit more for this) but we hoped it would avoid any of the changes & delays that others had experinced with the likes of Small Planet & Germania etc, it paid off! Flights on time, first drop off on the shuttle bus which in itself would have been quicker but for a couple who were booked on the shuttle had taken a rental car without informing the rep's. Dropped off cases, changed into lighter clothes and went straight up to the pool bar introduced ourselves to the regulars Pete, Flic, Mandy, Steve & Dee and owners Nikos & Natasha & their son George then proceeded to get a teensy bit tipsy on cocktails! Next day spent exploring Paleo, ate at Limani by the Harbour, really good food & service, waddled back up to the Belvedere and over indulged in cocktails again! Next day Other Half convinced me it would be great to walk up to Lakones via the donkey path, within 15 minutes I hated him with every fibre of my being, 20 minutes after that I loved him heartily again because the views are spectacular. Walked up to Bella Vista and the couple of shops up there then back down to the village and had lunch at Boulis Taverna, lovely old style place with "Mom n Pop" service. We walked back fown to Paleo via the road which was a lot longer but worth it if only for the visit to "Georges Cellar" we tasted & bought wine & Raki. Ate at Spiros near the top end of Paleo for dinner, had mixed meat on the spit, again, really good and filling food. Next day, hired a scooter for two days, went back up to Lakones, Mikrades and Angelo KastroCarried on up the coast and made it to Agios Georgios, nice long sandy beach but it made me glad that we were in Paleo. Rode up to the Monastry for sunset. Evening meal was at The Dolphin next door to the Belvedere, decent food with a nice setting overlooking the sea. More scooter adventures, rode to Gouvia and Dassia and back, popped into La Grotta Ate at Nausika for this evening. 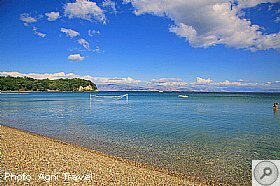 The rest of the week was pretty much spent on various beaches sun bathing, swimming & snorkelling, except for a trip into Corfu town on one of the Olympic organised excursions. Overall we had a great time, Paleo is stunning with another amazing view around every corner. The Belvedere was very basic but if you go with an open mind you wont be disappointed, with the sea just down the steps, a view to die for from your balcony and a decent kitchen & bathroom in the room, a pool, bar & restaurant all on site I don't think you can go wrong as far as self catering accomodation goes. My recomendations are; Food - Limani, Spiros & Nausika. - Not based on price but on food quality & service. Drinks - Akron - Nice place & cheap for local beer, also serve Corfu Beer, Belvedere pool bar - Cocktails and great friendly regulars and Petrino Garden - cheap as chips & quiet 2.50 for a pint and 2.00 for a glass of wine. Tango bar for views. Do do the walk to Lakones and spend some time exploring, it's worth the asthma attack and aching calves! I'm going to Corfu for a week in October with my son and I was wondering if anyone knows of anywhere that rents out sailing dinghies (not yachts) please? I have searched on-line but so far have only found one place; Corfu Sailing Events in Avlaki. I emailed an enquiry almost a week ago but haven't had an answer so, in case that doesn't come off, I'm trying to find alternatives. 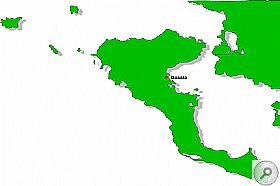 We're staying in Dassia but I am hiring a car so we can get around the island if necessary. If you don't know of any actual hire centres can anyone offer any advice on any good sources of information. The several hours I've spent on Google haven't really paid off too well. Oh it won't be Corfu Town that they put you up in!! We have been to Ipsos, Dassia (lovely owner shouting at everyone), and best of all Kavos, just where you want to go when you have chosen quiet Paxos. Could be worth seeing if you could get a cheap room in Corfu Town though and just tell them you'll see them at the port. That's what we thought Joe, it hasn't cost us much, in fact it was cheaper than self catering in Spain, we have never been to Corfu, so if we don't like the food or drink we will just head out in to Dassia as I've read some good reviews on the place. Flying with Thomas Cook Next Monday from Birmingham. Have been checking for last few weeks and flights are on time or early! Just checked on price of seat and they are Β£279 if booked direct through Birmingham airports travel site for the flight next Monday. See you next week in Dassia. I got 200 Rothmans gold for; 350 Euros in Dassia supermarket. By the way Elliemay, (that rhyme !) How come you can type a euro sign on your keyboard and I can't? Maybe my keyboard like me, is out of date. Depends when you want to stay as some accommodation doesn't open until June/July. In May we stayed at the Anna-Liza in the village that has a nice pool, there is also Sunrise Apartments (Calypso bar), the Mega Hotel, the Yannis (up a steep hill at the side of the town hall), Dominoes, Lavrion, Jason & Margarita are all up at hill at the Dassia end of the strip - OK if you don't mind a walk, there are a number of others such as Konstantinos and Antigoni (Pyrgi Place - Dimitris) that are down in the village near Bonita restaurant. Panos is running a coffee shop in Corfu Town and yes the Temple Bar is now Wet. Dirty Nellies was not open when we were there in May and not sure if it is open now as lots of places are a bit slow to open up, there was a bit of activity painting and cleaning up when I walked along the front so should be a bit livelier this month onwards. If you look on Travel Republic website you will find plenty of accommodation listed, yes things are a lot quieter these days (apart from August when the Italian holidaymakers arrive in droves). A couple of places stay open all year such as Tiffanys and I think ALS (on the sea front) run by Dino's Son, there were also a number of other bars and tavernas open so you will not be stuck for somewhere to eat and drink. There is also the AB supermarket if you are self-catering which is on two floors and you can get all your essentials as a reasonable price. Enjoy your holiday. I think you can get the Paleo bus to the Dassia/Ipsos cross road and change bus there without going into town. I'm sure my son did it a few years ago. Looks like its raining and cloudy today. Was just looking at Kassiopi webcam. Will be in Dassia in about 5 weeks, hopefully the sun will be properly out by then. Thanks for the advice. We are planning on getting a car and exploring a bit and getting the bus to Dassia for the day. Don't know the mileage exactly, but we have walked from the far end of Dassia to Ipsos in about half an hour, walking briskly. Does anyone know how far it is to walk from Dassia to Ipsos? From reading facebook, it appears the Dassia Sconto is closed too. What about the Sconto at the Dassia junction on the way to Paleokastritsa - Is it still there ? I am going to Dassia on 2nd April. Can anyone tell me if it will be open at this time of the year. Never been to Corfu before. Should I hire a car? Topic: Tempted To Long Weekend In April! 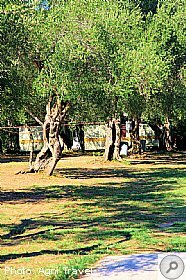 Gouvia is on the Dassia blue bus route so you will be within easy reach of Corfu Town. Plenty to see and do there if the weather is not kind. View Topic: Tempted To Long Weekend In April! in April I would only look at a radius of 12 kms approximately from town- the limit of nthe more frequent local buses. Then if the weather is poor you can get into town, and if good use your resort as a base for exploring the rest of the island. Thanks. I'll check it out in May when I will be in Dassia. Thanks all for your help and suggestions. Top Car seems to be a little more expensive than the others. Has anyone used Fair Deal car rentals based in Dassia, the website and their reply to my emails seem to be OK and rates are good? We go from Paleo to Kassiopi on the local buses to see friends quite a lot. You get on the bus in Paleo but don't go all the way into Corfu town. Get off the bus at the traffic lights/cross roads. (where the road into Corfu town and the coast road to Kassiopi meet. You will see big signs saying Dassia/Kassiopi etc). Walk across the road when you come off the bus and you will see a bus stop for the bus to Kassiopi. Ask somebody if you are not sure and do the same again on your way back. It saves you going all the way into Corfu town and back. Apologies got mixed up with the hotel. We stayed at the Corfu Chandris, not the Dassia so can't give a review on that one. The only experience we had of that was the Greek night which was good. We loved Dassia, it had a bakery/coffe shop is this still there? Does anyone have any reviews (fair and honest ones) of the Dassia Chandris, I ve looked on trip advisor but it just looks like the critics were expecting the Ritz and I know that it isnt like that! I love Maddy too Dassia...but will miss her visit to the North East this year. Topic: TV Programme "Corfu: A Tale Of Two Islands"
When I first went to Corfu in the mid-1970s, Dassia-Ipsos was very busy, partly because of the Club Med. Benitses had some tourism but hadn't yet become party central. As the show has ended, it's evident the makers did just what they set out to do. Maybe those of us feeling somewhat let down by it were hoping that Corfu would work its magic on them and they'd want to expand a bit more on the interesting history and mix of cultures, and explore beyond the beaches. Oh well, we did meet some intrepid folk--mostly ladies--"living the dream" for better or worse and feasted our eyes on that beautiful scenery. Hope it intrigued a few people who've never been there to consider Corfu for next summer's holiday. View Topic: TV Programme "Corfu: A Tale Of Two Islands"
Gouvia is all ways a stop off for me when we are driving in to Corfu town especially going through Ipsos & Dassia some of the yachts are wishfull thinking. There are roadside fruit and veg stalls too - we use one near Dassia and I think there is one to the South of Corfu town too. May to October they seem to be there, not sure about in winter. The fruit and veg are fresh and not too dear, better than most supermarkets or mimi-markets anyway, in my opinion. We bought most or our stuff for our house in Barbati from Profi and Ebanos which are on the road from Corfu town towards Dassia. Ebanos do deliver and they were actually very good. We found furniture to be quite expensive but for the amount we needed it didnt warrant buying it at home and shipping it out. Didnt seem to be many shops when we were buying in 2007 but now we see quite a few. Most are on the main roads in and out of town so if you have time take a ride out and check each one. We have been visiting Gouvia since 1988. Still enjoy it as much today as we did then. We find it very laid back & relaxing. No nightlife as such. There are a few nice restaurants & bars e.g. Molfetta Beach which overlooks the bay. 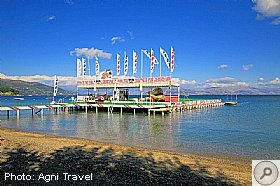 We find Gouvia good for getting to other parts of the island e.g you can catch the local bus to Corfu Town very easily or the other way to Dassia & Ipsos. We enjoy a walk from Gouvia to the next resort of Kontokoli & the Marina. We will be going back to Gouvia in September 2012. Taxis will cost about 10 euros each way to get into town. You can get the bus either on the main road, turning left out of the hotel (the bus from Dassia to Corfu town) or if you turn right out of the hotel, walk up the hill and catch the bus outside the mini-market. It costs 1.50 Euro if you buy a ticket on the bus or 1.00 Euro if you purchase the ticket in the mini-market. leaving at 19.30 and returning at 23.00. Hope that helps! Have a great time. Its about 1.5km out of town, near the new Port. The bus to Dassia runs past the end of the road but not sure on times. I think there may be a courtesy bus that runs into town (I'm sure I read that somewhere!!). I have a friend who works there so I'll check. My daughter has just returned from Dassia and the temperatures there for the past week have been around 47 deg!!! Here are some of the Festivals in Corfu. Local holiday commemorating Union with Greece. Processions are held in Corfu Town. 28th May Ascension Day. Festival in Kato Korakiana near Dassia. 7th June Pentecost. Festivals in Lakones and Kastellani Mesis. 8th June Whit Monday. Festivals in Kontokali, Argirades, Kastellani Mesis. 24th June Agios loannis Day (St. John). 2 day festival in village of Agios loannis (Approx. 8 km to the north of Corfu Town heading for Paleocastritsa). 11th/12th June Formula 1 World Champsionship Power Boat races in Corfu Town (Garitsa Bay). 8th July Agios Prokopios Day. Festivals in Agios Prokopios village and at the church of the saint in Lefkimi. 10th August Varkarola - concert of traditional Corfiot cantades presented from boats moored in Garitsa Bay, Corfu Town. 11th August Dedicated to patron saint of island - Saint Spiridon. Procession in Corfu Town starting at 9 am. Festival also in Kastellani. 14th September Festival in Sidari at the monastery of Agios loannis. 26th October Saint Dimitrios' Day. Festival at Ano PavIiana. Ochi Day. National holiday commemorating Greek refusal to allow Italian invasion in 1940. Procession in Corfu Town. Hi! Just to let you know me and the wife plus 3 foster kids (15, 13 and 3years) are going to Dassia 20th August to 3rd September. This will be our 20th year now, great place! We always stay at Karda Beach. If you need more info let me know! Topic: Is Anyone Going To Gouvia? Thanks Rick_chef, very helpfull. I will venture out of the resort a few times. I can tell you where there is also a very nice place to eat, it's where the locals eat too (this is also a very good tip). Well actually I don't know the name of it, it's on the main road to Ipsos, just past Dassia. You go past the antique place going towards (it's on the left hand side) It's behind bushes a quite hard to notice when driving past, you'd have to slow down to notice it. Highly recommend!! . View Topic: Is Anyone Going To Gouvia? Once you have seen one garden centre you will see loads! There are two or three around Kontokali on the main road then two more on the main road just past Ebanos and Profi. If you head for the airport from Dassia end you will see all these plus two or three more on the main street before you branch off right for the airport, not sure what it is called there. Can anyone tell me were I can buy pitta bread the type we get in England were we can heat up and cut in the middle to form a pitta pocket. Please help if you can. I was told Sconto in Dassia sold them. But not any longer. Maybe you could ask in Dassia if there is a sea taxi that could take you there and bring you back. Got to be the best way of arriving at Agni by boat, even if it gives the locals a giggle trying to see you moor up and disembark! Been there and done that and also have the T shirt. I have stayed at the Telemachos Hotel for the past 22 years, sometimes twice a year so that may tell you something about it!! You must bear in mind that the hotel is 2 star only and therefore, do not expect the standards of anything higher. We have always 'taken things as they come' in Corfu and as you can guess, have been very comfortable with everything about it. The staff have always been exceptionally helpful and friendly and we look forward to our coming visit on the 21st of May. As we only stay bed and breakfast, we have a couple of great places where eat in the evening within a few minutes walk of the hotel. The first is 'La Casa' and Alexandros, which is further along the main road but still within an easy walk. The other is called Mam-A-Taka which is on the other side of the road before you get to La Casa. There are several other tavernas in Dassia, but of course we have our 'favourites'. The road down from the Telemachos is fairly steep but after you have walked it once or twice you get used to it. If there is anything else you would like to know about the hotel, please let me know. I am sure you will enjoy your holiday and will want to return next year. Hi has anyone stayed at the Telemachos Hotel before? Or been to Dassia? Me my husband and two kids are booked for August and would like some info on nice tavernas/Greek nights/places to visit please. We have stayed twice at Spiti Prifti, as Muffy says lovely pool and garden - and the blue bus stop is almost outside. This is very handy for exploring Corfu town (and Dassia the other way) and the busses run well into the evening. The area is not hilly and there are plenty of places to eat and drink in Gouvia and Kontokali. Hi, can any one tell me if the cash machine in Dassia (Emporium Bank) is still active? This is the only one I've ever seemed to be able to get cash out from along the Dassia, Ipsos strip. Do any of you know if the shops/supermarket and tarvernas are open the last week in April in Paleokastritsa or LiapΓ‘des. We are planning to stay 4 nights in Dassia and 3 nights somewhere else. Is Paleokastritsa or LiapΓ‘des a good choice. We will not be renting a car. I`m currently holding 2 hotel reservations and have to cancel or book tonight. We haven't stayed at the Ipsos Beach Hotel but have spent many happy holidays in Ipsos back in the good old days when you stayed in village rooms and didn't have either a swimming pool or air conditioning included in your package holiday! Those were the days! I could go on and on about the great times we've had in Ipsos so I'd better stop now! We made many good friends there and still call in to visit them when we're in Corfu. When you book with Travel Republic they ask within their booking process the name of your hotel/apartment etc. The bus we were on to Kassiopi dropped people off at their hotel in Dassia and not on the main road. Lord Travel look after you and they have their own buses. Their desk is just outside the arrivals doors where the reps stand. The staff all seem to be British so you can ask them to ensure you are dropped off at your front door if a bus can get there. We have used them many times and have always received a good service. We have already booked for June this year. View Topic: Transfers From/To Airport? I also have the same problem with transfer to and from our hotel. As there are five of us this time (plus 4 suitcases) I looked at Travel Republic. The destination I need is Dassia but they do not say whereabouts in Dassia they drop you off. Would they drop you at your hotel if you asked, or just at a certain point in the village? As our hotel is at the top of a very steep hill, I would not like to have to walk from the bottom with 2 young children and four suitcases especially at around 11 pm!! The bus does. It continues on going through Nissaki and finally stopping at Kassiopi - where it then turns around and goes back. Just came across this video from 1952. Amazing pictures of the Island from Corfu Town to Kouloura, Kassiopi, Palaeocastritsa. A few very amusing shots of Club Med in Dassia - check out the dancing in swimming costumes! This page was generated in 5.016 seconds.